Exifer hasn't been updated for years now and there won't be an update in future. I want to thank all users from all over the world who sent me postcards for registration in the past. I didn't answer all of them because it was simply too much for me. Many many thanks!!! You can still download Exifer below, but I think in the meantime there are a lot of applications which do a better job, because Exifer isn't state of the art in speed, look & feel and functionalety anymore. As a replacement for Exifer, I can offer my new application GeoSetter, which perhaps may be interesting for you as a replacement for Exifer's features regarding IPTC editing and viewing EXIF data. I can especially recommend IMatch which I've been using for about 3 years now as a database solution for organizing my images. It's not free, but it does almost everything which can be done with images - in other words, in my opinion it's absolutely worth the money!!! As an alternative for Exifer in viewing the EXIF data of images, I can highly recommend PhotoME by Jens Duttke. It's still under development, but it's free too and it already shows all the technical data which slumbers in your digital images. For renaming and sorting images by their metadata, you can try AmoK ExifSorter and for those of you which are familiar with the command line, ExifTool by Phil Harvey may be the best solution because it reads and writes nearly all meta data from/to a large number of different file formats. I'm using ExifTool also for my application GeoSetter. Exifer is a nearly free software (you only should send me a postcard if you're using Exifer frequently) with which you can manage the metadata (EXIF/IPTC) of pictures taken by digital cameras. Because many image processing software destroys this metadata when saving such files, the idea was to create a backup of the metadata before editing it in any software, and then, after that to restore it back into the processed file. With Exifer you can do this very easily.
! When adding watermarks in batch mode for more than one image, the inserted data will always has been taken from the first image only.
! Creating and removing thumbnails didn't work.
! Exifer created an empty file c:\exifer.txt.
! Empty date fields has been exported as 12/30/1899 to CSV.
! Fixed error with proxy port on startup when upgrading from prior version. + Minolta makernotes (special thanks to Dalibor Jelinek). * Optional display of unknown EXIF makernote fields. * Improved rewriting EXIF data (e.g. the data now won't be totally rewritten after rotation or date field changes). * Improved functionality of HTTP access to checkup for updates.
! Improved speed of refreshing the list view while reading data.
! Fixed display of some EXIF fields.
! Fixed some minor bugs. + Watermarks can be inserted with size relative to a given reference. * Improved zoom features in slideshow mode.
! Changed Shortcuts hasn't been saved.
! Other APP-markers than EXIF and IPTC has been deleted after rotation.
! Customized shortcuts won't be saved.
! Makernotes won't be displayed on TIFF files.
! The dialog for importing camera focal length values appears outside the screen, so it's not visible.
! The field "Digital zoom" in Olympus makernotes won't be displayed correctly. + Crop feature with aspect ratio (in slideshow view). + Watermarks (text can be inserted into images). + Added delete directory to browse window. + Displaying thumbnail in slideshow. + Optional updating of EXIF modified date. + Zoom feature in slideshow. 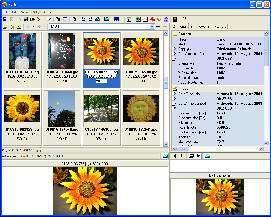 + Added copy/cut and paste (ctrl+c, ctrl+x, ctrl+v) for copying, cutting and pasting images. + Added rename to slideshow. + New options for backup "yes", "no", "ask". + Added quality selection for thumbnail creation. + Added import of Cumulus categories into EXIF/IPTC data. + Directories will be shown in list view. + Added image delete to slideshow. + Added shortcut for image delete.
! "Portrait mode" and "Landscape mode" of exposure program in EXIF data hasn't been recognized correctly.
! When running under Windows 95 the DLL MSIMG32.DLL hasn't been found.
! "Open With" didn't work with filenames containing blanks. * Display format of some exif fields ("shutter speed", "brightness"...). * Renaming now also is possible with files which dowsn't contain EXIF date information. * A few minor changes. * Improved "open with" customizing.
! Some minor translation bugs. + Toolbar with "open with" software.
! Image height and width in Exif info sometimes hasn't been set correctly after rotation. * All changes from v1.0.15 beta are now also available in English language. + Added time offset feature to edit dialog. + Option to add/remove Exifer to/from the Explorer context menu in options dialog. + Possibility to enable/disable asking for creating a backup when opening an image by "open with". + Showing progress when reading a directory with lot of images. This update was in German language only. + "Insert from file" (*exi or *jpg) is also possible for all selected files now, not only one file. + Export dialog allows customizing of separators and delimiters (screenshot). + Exif export of all JPEG files in subdirectories. + Improved behaviour when changing, deleting or adding files to the actual displayed directory. + Option to display and export exif infos in raw format (for example '30/10' instead of 'F2.8' for 'Max Aperture'). + Customizable camera values for converting the focal length to an equivalent value of analog cameras (screenshot). + The time stamp of an image file will be saved into the backup files and can be restored optional. + Purging files in backup directory after a certain time period or when the total size of files exceeds a certain value. + Customizable export of Exif values to a CSV file. + Customizable menu with programs for "open with" (screenshot). + Drag and drop to other applications. * Many little things and many minor fixes.
! Fixed problems with bigger fonts. + The date fields now can be changed for all selected files without changing the time. about 15000 x 2000 pixels). + New replacemet dialog (screenshot).
! A lot of fixes of minor user interface bugs.
! Fixed all problems with tested cameras (see above) and hopefully with all cameras in general.
! Improved the speed of reading a directory with picture files.
! "Load"-dialog had the default extension "exif". Now it's "exi". + Moved all buttons to a menu. + The file list box has got a popup menu and a new column which shows if a backup for the exif information exists. + The date fields and the user comment can be edited for all selected files ("Exif | Edit..."). + Reading/writing the user comments of all selected files from/to a file "descript.ion". This is a hidden ASCII file which can be handled among others by ACDSee.
! Enabled "Load" button when picture has no exif. Argument" which occurred every time Exifer doesn't like a picture.
! Disabled temporary special camera notes (maker notes). pictures when adding user comments. Ricoh-, some Kodak-, Sony and other Cameras). + Editing of date and time fields. + Editing of user comment. This software is provided "as-is". No warranty of any kind is expressed or implied. You use at your own risk. The author will not be liable for data loss, damages, loss of profits or any other kind of loss while using or misusing this software. You are granted the right to use and to make an unlimited number of copies of this software. Commercial use and distribution is not authorized without agreement. Installing and using this software signifies acceptance of these terms and conditions of the license.